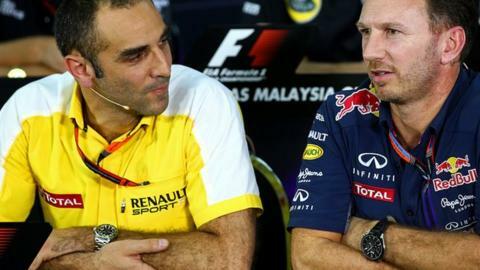 Renault's Cyril Abiteboul (left) responded to criticism from Red Bull last season stating that the team was "high maintenance"
Renault is steeling itself for a difficult 2016 following its late decision to return as a team owner. The French car company last week finalised its takeover of Lotus, who finished sixth of 10 teams this year. Renault Sport boss Cyril Abiteboul said the team's situation meant "there is no way you can expect fantastic results". "We've a clear plan, not only for next year but for years to come. Next year will not only be a success if we're doing well on the track," he added. Abiteboul said 2016 would mainly be about building up the organisation and resolving the problems with Renault Sport's engine department, which has lagged behind standard-setters Mercedes since turbo hybrid engines were introduced to F1 in 2014. Renault will also have to work on integrating its dual bases in Enstone in Oxfordshire, where the chassis is built, and the engine base in Viry-Chatillon near Paris. "There are many things that we want to do well next year, starting with the structure," said Abiteboul, in his first interview since confirmation of Renault's return to F1 as a constructor. "We want an engine that is completely reliable at the start of the season and at the first test. We want to make substantial steps. "The target for next year, it is not just about scoring points in the championship. If that is your question, we need to be humble in our expectations for next year." Abiteboul said he would "prefer not to confirm" that former Mercedes and Renault technical director Bob Bell would be appointed to a role overseeing the integration of engine and chassis departments. Sources say Bell has been working in this capacity for at least a couple of months, since long before the takeover was officially confirmed. But Abiteboul confirmed that British engine builder Ilmor will work with Renault to enhance its power-unit development. Renault has bought back the team it used to own from 2001-09 and which won the title twice with Fernando Alonso in 2005 and 2006. Fernando Alonso urged Renault to stay in Formula 1 stating that "Renault and Formula 1 are quite linked together in the history of this sport, so hopefully they stay"
The decision comes after Renault decided it did not receive enough credit or exposure for its four consecutive world title doubles won as engine partner with Red Bull from 2010-13. Chairman Carlos Ghosn has set the team a target of competing for the championship within three years. "We know it is going to take time," Abiteboul said. 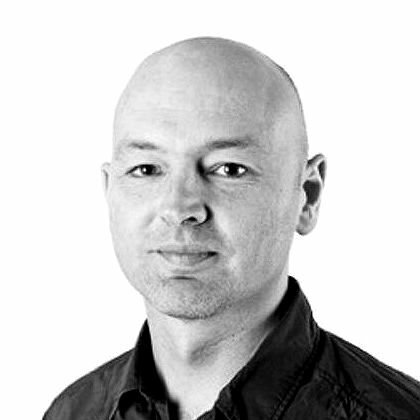 "What matters is that the marketing story doesn't wait. "We have been very successful in F1 with Red Bull, we have been successful as a competitive team before and, from a marketing stand point and connection between F1 and the rest of the business, we have never been so strong. Abiteboul said he was confident Renault had the budget to compete with Mercedes and Ferrari. Renault is planning to reveal more details about its plans for 2016, including the identity of leading figures, including team principal, in either late January or early February. Why can't England find an opener? Read more on South Africa v England: Why can't England find an opening batsman?